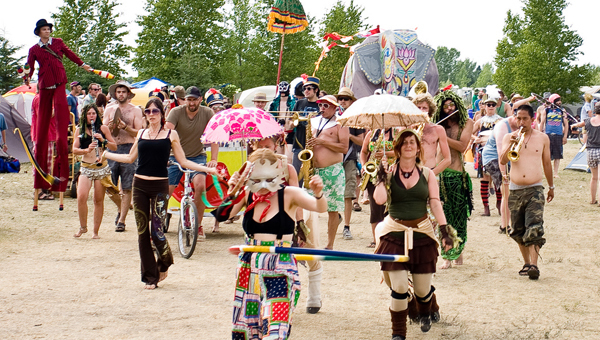 Folk Fest is one of the biggest folk festivals in North America, with a reputation for booking interesting and amazing acts. 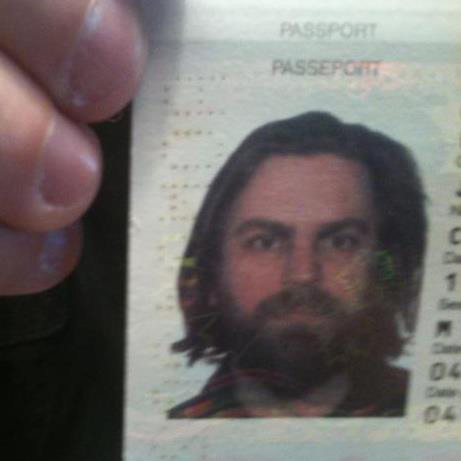 I had never been to this particular Folk Festival, and truth be told, I had actually never been to any Folk Festivals other than the ones held in St. John’s – of which I had the job of doing all the bookings for two years (a whole other story for another time). The research stage of any design job is, in most cases, the most important phase of the job, and one many young or new designers overlook. I can’t stress enough that you need to know every thing you possibly can about your client, their clients, and their competitors if you want to successfully communicate the job. I called friends I knew who had attended and played the festival in the past. They told me what their experiences were and what made this festival different. I read reviews of the festival online, and picked through hundreds of photos from past years online. Now I was feeling like I understood this Folk Festival – I was now ready to start coming up with concepts. 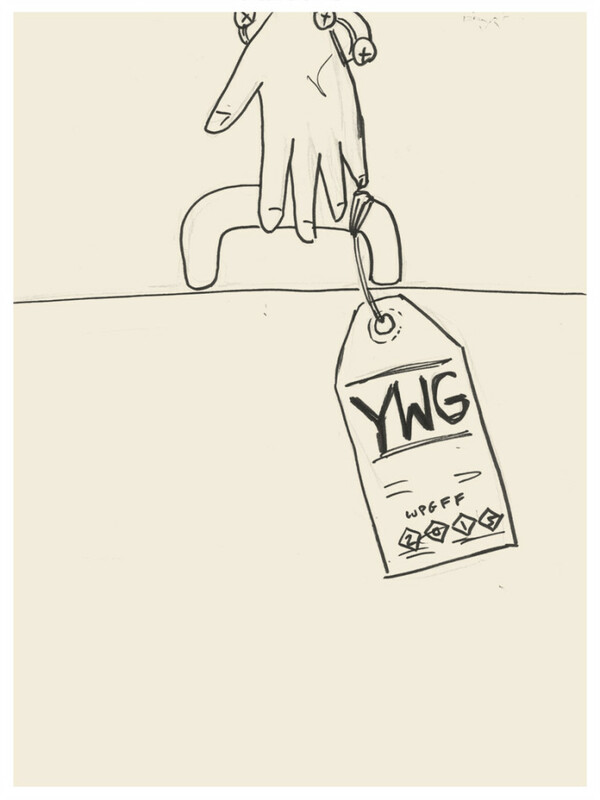 For nearly a week I sketched ideas, and jotted down every little thought that potentially could lead to a festival poster. At some point I cut that list down to fourteen ideas. Normally I never pitch fourteen separate ideas to a client, its insane, too much to consider. 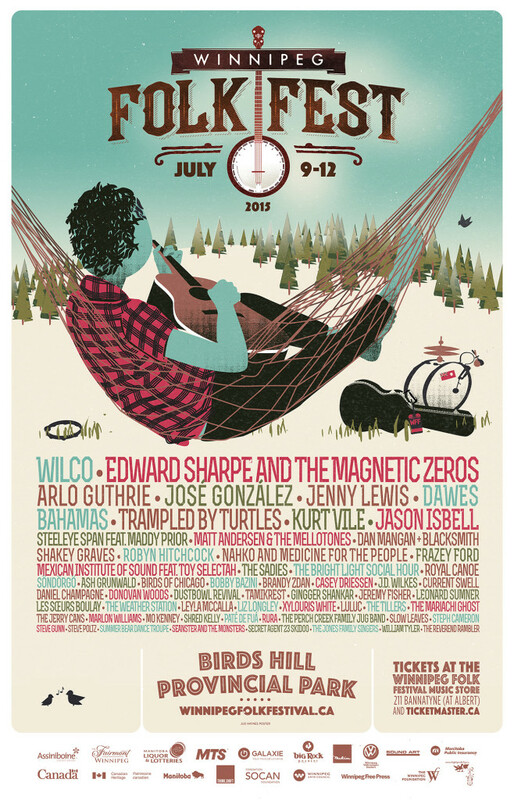 But, since the Winnipeg Folk Fest were a new client whom I didn’t necessarily know all that well, and because I needed to somewhat feel out where their heads were in terms of how far they wanted to push the design for this year, I went in with a lot of concepts. They passed around the ideas and came back to me with a short list of six, and wondered if I could mock up some of those so we could see which one was the clear winner. As I looked over the short list, I discovered that there was a way to make four of them work in one campaign. 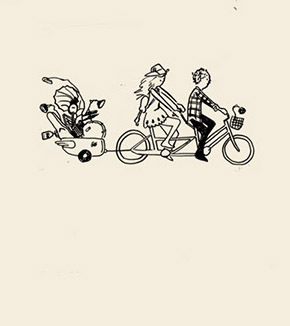 There was a couple riding a tandom bike, a person in a hammock playing guitar, a one-man band marching to their own beat, and a close up of a hand grabbing a handle with a WFF luggage tag – the handle could be for a guitar or mandolin case, or a suitcase… all of these ideas could be rolled in to one. It was ambitious to take a simple poster job and turn it in to four separate posters, but I knew that the final campaign would tell a fun story and the extra effort would be worth it. I went back to my contacts at the festival with sketches of poster mockups showing an early version of our blue guy and his friend. I thought of a young musician getting ready to go to the festival, packing his bags and his instruments; then riding to the festival with his lady on their bike; performing all over the festival and then taking a break a the end in a hammock. Its the perfect day really, and I felt it represented the destination aspect of the festival well. There was some discussion back and forth. Were we creating characters that audiences would need to resonate with? Were these characters going to become cheesy mascots like you see at sporting events? 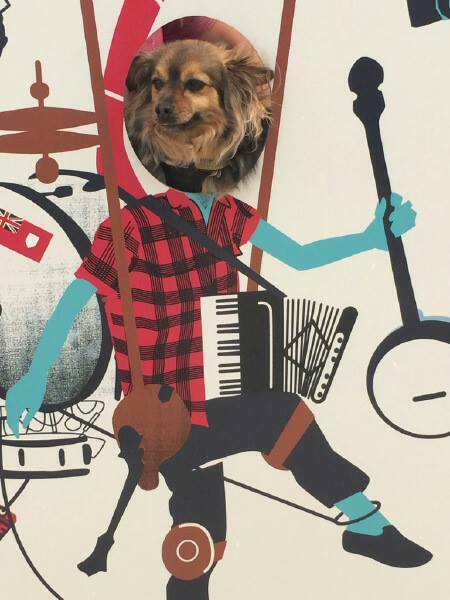 How could we create an original look for our characters that would appeal to the varied audience that make the Winnipeg Folk Festival part of their summer tradition every year. 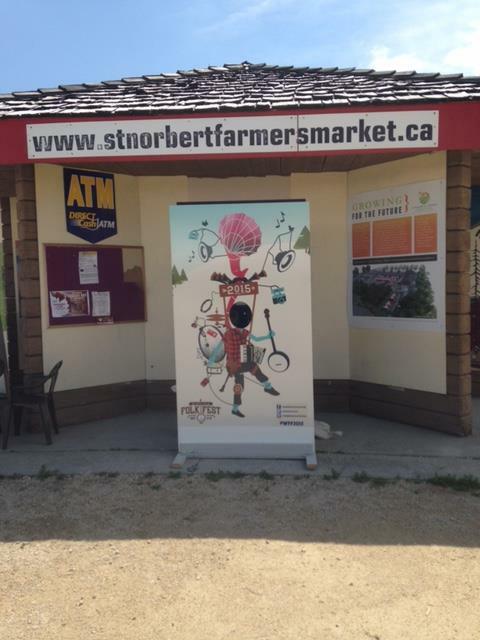 You see this festival draws thousands of teenagers, thousands of adults and young families with the babies, and even has a huge number of seniors that attend well in to their 80s and 90s. This is a community festival that appeals to everyone, and how were our little characters going to represent them all? In the end I was given the go ahead, we all knew it was a leap from what past poster campaigns for this Folk Festival had looked liked, but everyone seemed on board, we had nothing to lose by trying something new. I began developing our characters and colour palette. Why blue I was asked? Well there are no blue people in the world, so I thought that having blue characters wouldn’t focus on any one demographic as our audience. The characters would be fun, whimsical, and unique. Other than Avatar (the movie) and maybe some old Babar or Smurfs cartoons, there hadn’t been a lot of blue characters used that we could think of. With the exception of a couple small changes to wardrobe, the initial characters I came up with are the ones you see in the final posters. His shirt was changed from long sleeve to short since it was summer time. We had pondered maybe losing the moustache, but in the end opted to keep it. One thing I consider to be the secret weapon to any great design is colour scheme – so I set out to come up with a clean 4-6 colour palette that we could use for everything. 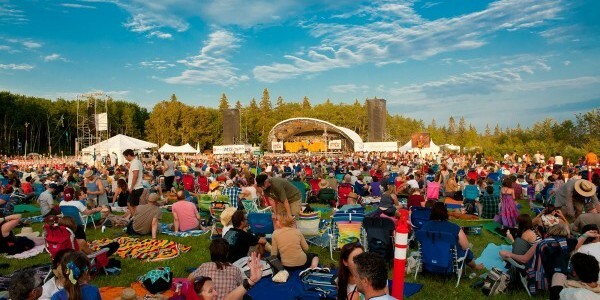 I didn’t want it to look like anything else, but at the same time we still had to communicate that this is an outdoor summer festival in one of the most beautiful settings Manitoba has to offer. Lots of trees, birds, sun and fun. With that in mind, obviously blue, green and brown were the first three colours. The red, then, came from our guy’s shirt, a red plaid (very canadian), but I knew there would be lots of other places to incorporate red and it wouldn’t be wasted just on a shirt. Plus, red and blue always look great together — think Spiderman, Superman, hell, the Winnipeg Jets?!?! The first round of posters were developed (illustrated by hand with pencil first, then in Adobe Illustrator, and finished in photoshop for colours and textures). I went back and forth with the client a couple times and within a few days we were signed off and ready to roll. The first teaser poster was revealed to the world at the beginning of February. It showed our blue guy’s hand reaching for what appears to be a guitar case handle. In early March the initial line-up for the festival was launched and tickets went on sale with a reveal of our second and third posters. These two featured the one-man band, and our couple riding on a bicycle built for two. 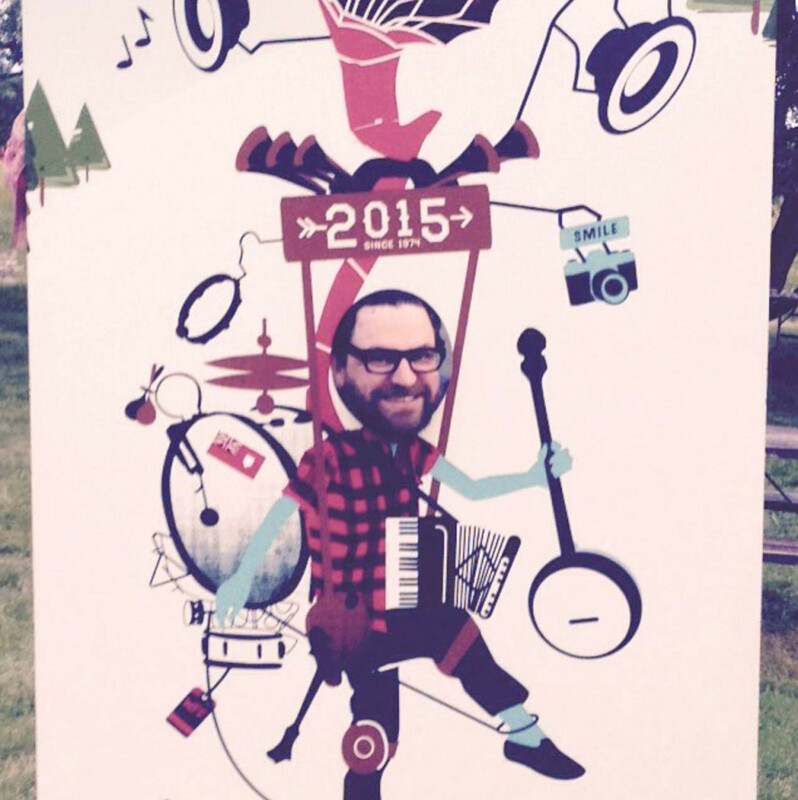 The Folk Festival organizers came up with the great idea to have a contest to name our guy. 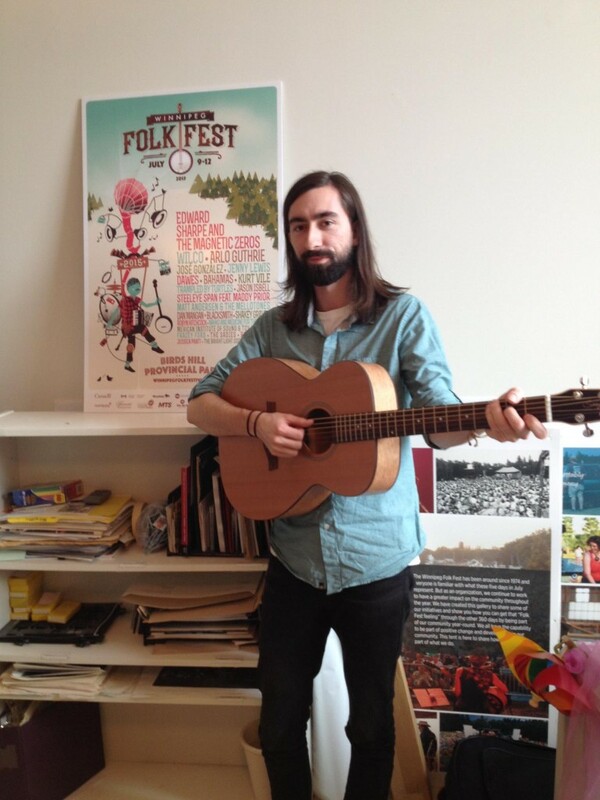 They received hundreds of entries and in the end Daniel Guezen was the winner and won a gorgeous Seagull guitar as his prize (pictured below). Newly named “Teal Neal and the Turquoise Noise” were a hit! It turns out audiences were reacting really well to the new posters and the festival line-up. Tickets were selling briskly and the festival was poised for another great attendance. 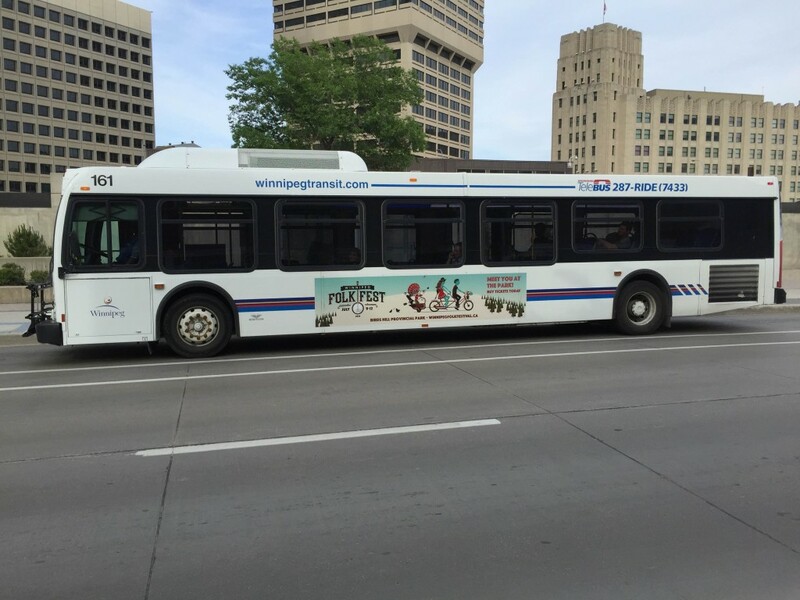 The festival’s marketing department got to work spreading the campaign out over various media – bus signage, billboards, print ads and even a photo board was built and did the rounds through out Winnipeg for a bit of fun. 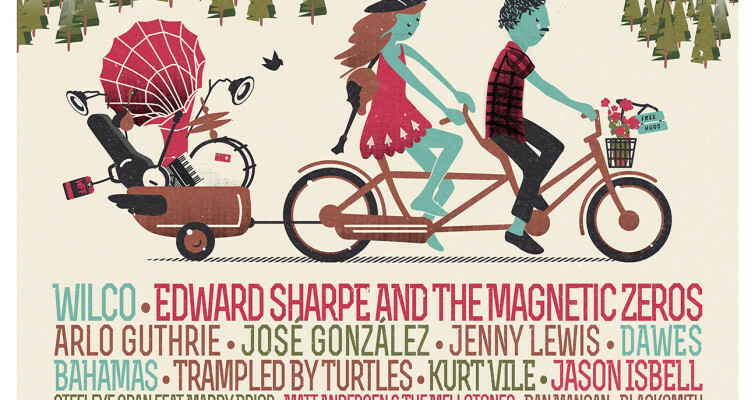 The fourth and final poster was revealed only a month before the festival. 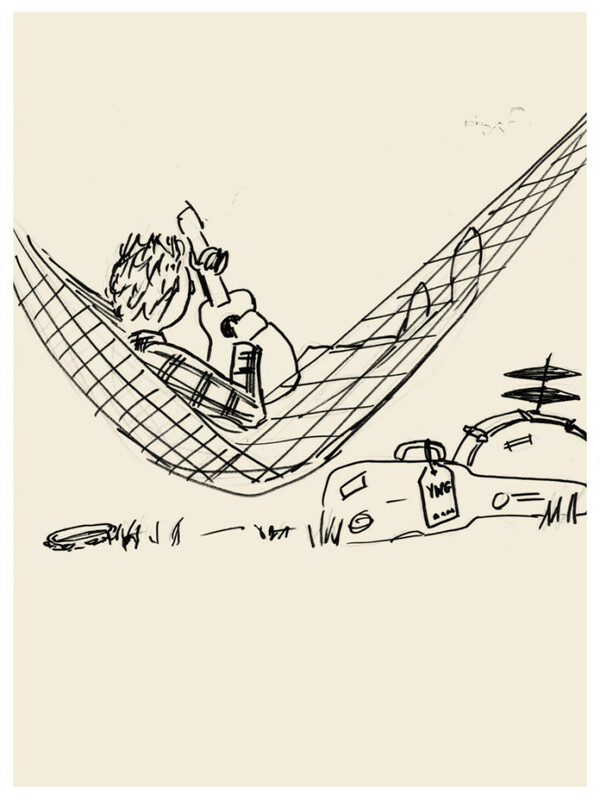 It featured Teal Neal relaxing in a hammock, playing his Seagull guitar. 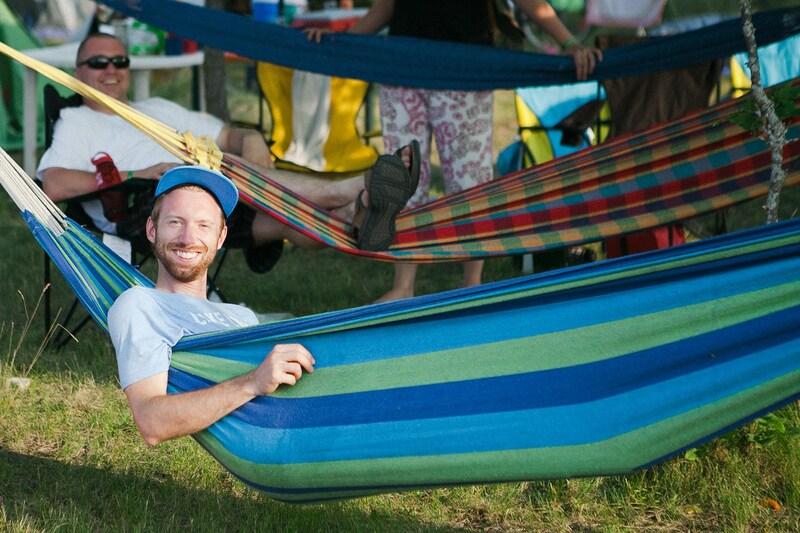 Hammocks play a large part in the personality of the festival and folks have them setup every where. 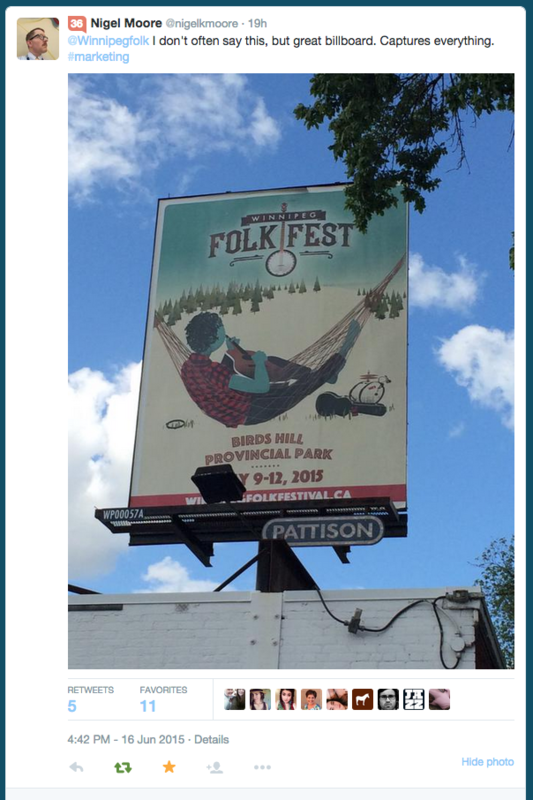 When Krista (my amazing girlfriend – also a designer and illustrator) and I arrived in Winnipeg, our first time attending the Winnipeg Folk Festival, we were immediately greeted by friendly festival volunteers wearing shirts with the hammock illustration. All 2700+ volunteers wore this image throughout the weekend, so I was pretty proud to see my drawing getting that much exposure. The Teal Neal photo board was setup by the kids zone, so I went and got my picture taken. There were mugs, shirts, baby’s onesies, hoodies, pins and more all promoting the festival using my illustrations. Very exciting – and so glad to see the festival adopting the new look so readily and diving in face first, using the graphics to their maximum. 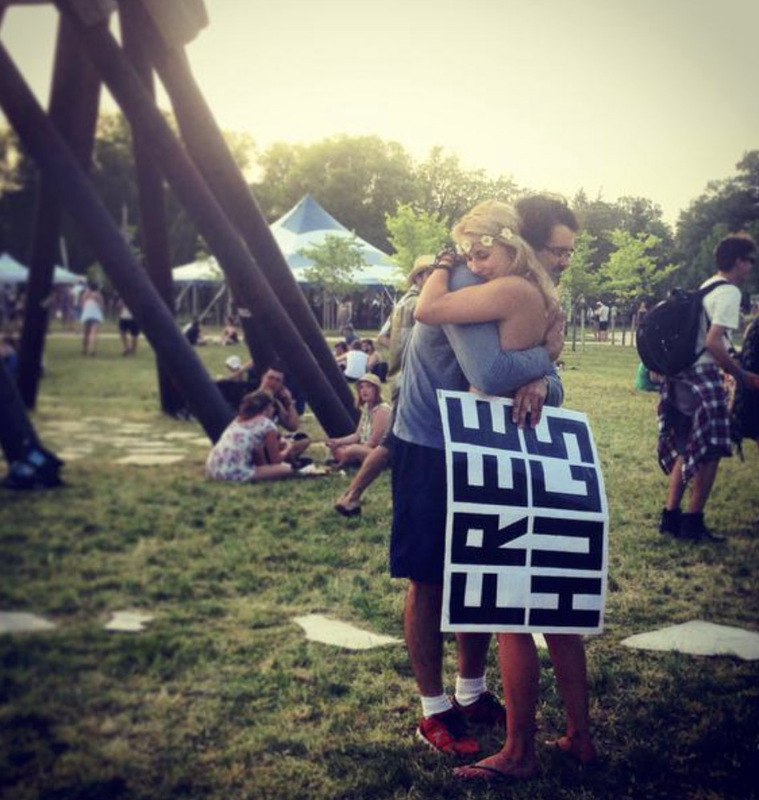 One little addition I had put in the posters was a sign that said “Free Hugs” as I had heard stories from everyone that a gentlemen comes to the festival every year and gives out free hugs. I ran in to this guy and while I didn’t have the guts to go get a hug, I stood aside and watched for about ten minutes as a solid stream of people of all ages lined up for their hugs. Families would wait in line and I wasn’t sure who was more excited, the kids or the parents. Winnipeg! You’re killing me! By day three the free hugs guy had a copy-cat, a young girl strolling with a “Free Shrugs” sign, who would throw people a smile while raising her shoulders up to her ears as she passed by. Pretty funny. We attended all four days of the festival, saw a lot of incredible performers, met lots of people and enjoyed all that was to be had. Saturday night was my birthday. I spent the whole day taking in the festival’s acts and then closed out my night having drinks with Dan Mangan, Jose Gonzales, and The Weatherstation among others in the hotel bar (what a great birthday!!!!). The staff of the hotel were so kind, they brought me a complimentary piece of birthday cake when they found out why I was celebrating (even after I told them a couple times that I didn’t need it). We spent so much time in that hotel bar, eating most of our meals there, that we became friends with the staff and our main waitress hugged us when we had to check out. We were blown away at how well the festival is organized. It is located a 30 minute drive outside the city, which you would think would cause major problems, but if there were any I couldn’t find them. Every fork, glass, napkin and bag on site was compostable, so there was virtually no garbage. Everything could be recycled or composted. 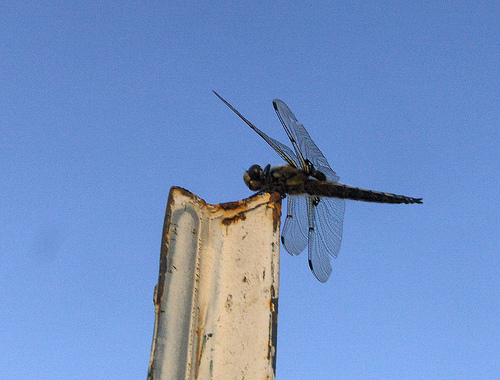 The weather was incredible, and while I’d heard about the famous flies and mosquitoes of Manitoba, we barely encountered any as it seemed the mosquitoes were out numbered by the tens of thousands of gorgeous dragon flies that buzzed overhead taking out all the smaller bugs before they had a chance to bite us. The Winnipeg Folk Festival audience was the widest age range of any music festival audience I’ve ever seen. I’d say a third of their audience are teenagers or college aged young adults. Then there were tons of young families who brought their babies and toddlers, then lots of older adults and a large selection of seniors that were there to party and enjoy great music along side the kids. The festival grounds are perfectly groomed and fully accessible by everyone, and with 2700 volunteers you were never left searching for help if you needed anything. It was lovely to see an environment where at midnight all ages were still enjoying themselves and there was no vibe at all that the night could ever turn sketchy. 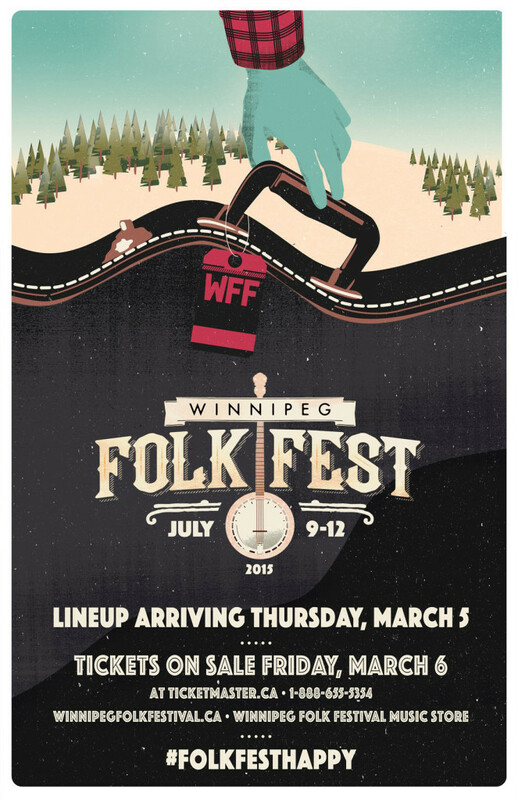 Overall, I couldn’t be more proud to have been invited to create illustrations and designs for the Winnipeg Folk Festival – this turned out to be a dream job, one of the most fun I’ve worked on. 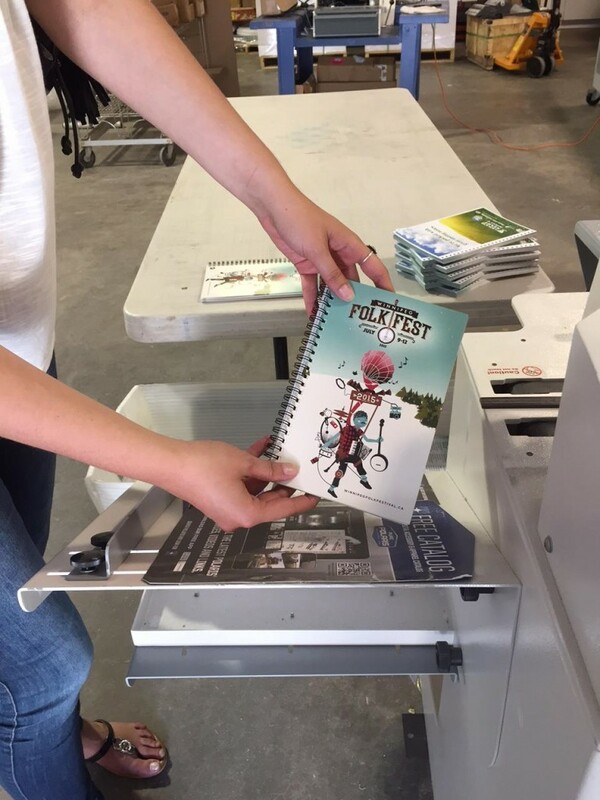 The festival is doing wonderful things for their community, I met most of the key organizers and they all treated me great, both while we worked together on the marketing creative months before the festival, and also as hosts when I attended their festival. I spoke to many of the volunteers and asked what it was that brings them back year after year, and their pride beamed as they told me how its part of their summer tradition. You’ve got something very special going on Winnipeg, its a beautiful thing. 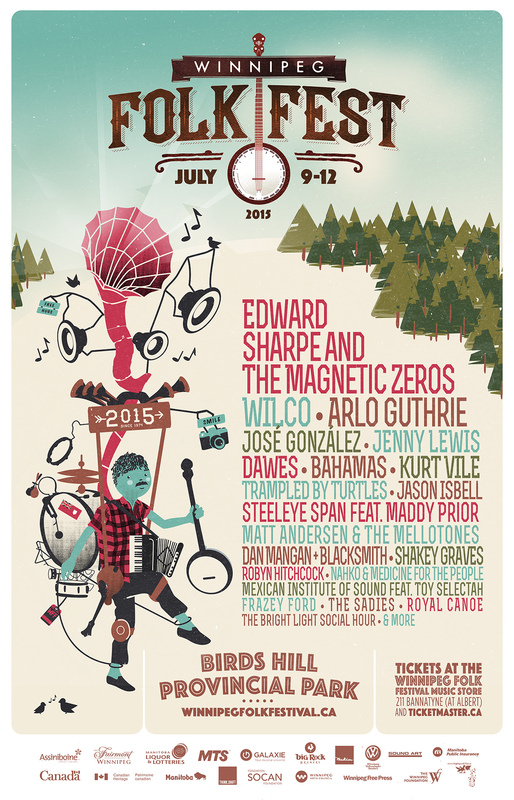 If you’re planning a vacation next year I highly recommend booking tickets for Winnipeg for mid-July so you can take part in the 2016 Winnipeg Folk Festival. This was one hell of a fun project. 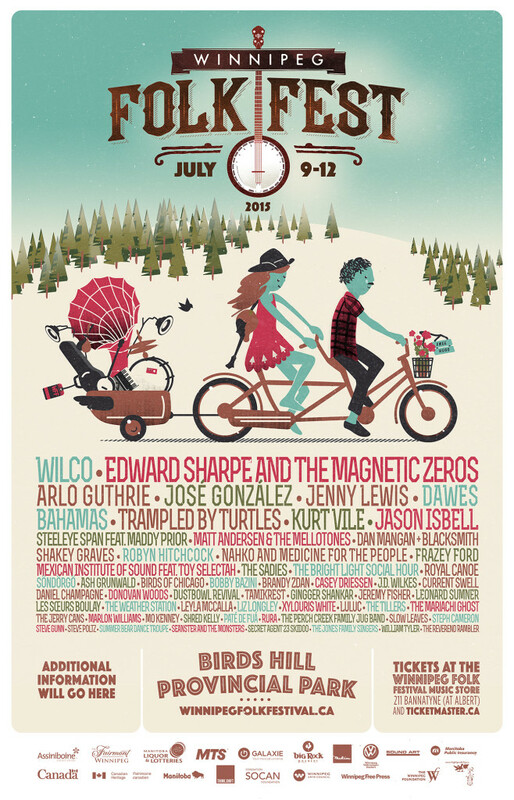 Ideas are brewing, and after the success of this year’s poster campaign I wouldn’t be surprised if Teal Neal and the Turquoise Noise make an appearance somewhere next summer.